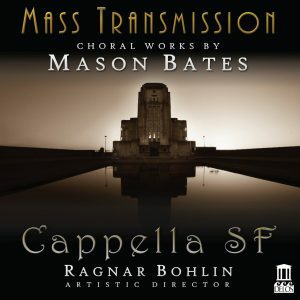 Mason Bates: Mass Transmission | Delos Music | Outstanding Classical Recordings for over 40 Years! Commissioned by the San Francisco Symphony for their 2012 Mavericks Festival, Mass Transmission brings to life the true story of a distantly separated mother and daughter speaking over the first long-distance radio transmissions between Holland and Java. Ethereal choral sonorities processed through a haze of radio static unfold into virtuosic organ toccatas. The texts for outer movements—from the eyes of the mother—are adapted from an obscure 1928 government publication about the technological advances made by the Dutch in communicating with their colonists. The text for the central portion of the work, from the eyes of the daughter, is adapted from the diary of a Dutch girl growing up in Java.